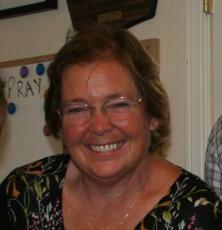 Just a few weeks after her husband’s death, Susan Riddering passed away unexpectedly on December 29th, 2008. Susan died from asphyxiation due to a blood clot in her pulmonary artery, while sleeping. Susan was vacationing with family in June Lake, California. Her work here being completed, she went to be with her Savior whom she sought to serve diligently, and her husband whom she loved selflessly. Susan Jane Riddering (Sue) was born on February 26th, 1955 to Constance and Calvin Foss in Pasadena, California. She was the youngest sister of three adoring older brothers. Her early childhood was a happy one, as her family was extremely active in hiking, camping, and water skiing. Sue grew up in Arcadia, California, graduating from 1st Lutheran Grade School. She then transferred and graduated from Arcadia High school. While still a sophomore in high school, her parents bought a historic hotel on Catalina Island. She spent her high school years traveling between her high school studies on the mainland and helping her family renovate the hotel on the island. At the tender age of 16, Sue met the love of her life, Mark Riddering, at a summer church retreat. The couple hit it off immediately, and, as Mark lived in Oxnard, the couple commuted to see each other as much as they could. Sue received her R.N. nursing degree at Pasadena City College where she was the youngest in her class (19 years old). Shortly after graduation, Sue married Mark Riddering on September 27th, 1975. The new couple settled in Ventura County, an area they stayed in for 17 years. While her husband completed the Ventura County Police Academy, Sue supported the new family by working at St. John’s Community Hospital. Following Mark’s employment as a police officer, Sue gave birth to her firstborn Sara at age 23. In the next three and a half years the couple had three more children: Rebecca, Samantha, and Luke. Sue took care of and home schooled her children until they all graduated high school. She would always say that schooling and raising her children was her life’s greatest pleasure. In 1992 the family relocated to the Santa Maria area, settling in Nipomo, California. Six years after they moved to the area, Mark Riddering was diagnosed with ALS (Lou Gehrig’s disease). Sue, very literally, never left Mark’s side for the 13-year duration of his disease–an exceptional, faithful, attentive, gentle, and long suffering caregiver until Mark’s death on November 27th, 2008 (Thanksgiving Day). The love in their marriage was a true picture of self-sacrifice and faithfulness, rare, beautiful, and inspirational to all who had the privilege of knowing them. Sue will be remembered by her family as an extremely strong woman of Christian faith, trusting unwaveringly in God’s goodness, wisdom and love throughout her husband’s entire illness. She commonly said that she found the most comfort from good theology, old hymns, and hard work. She was the strong pillar that held her family up and made them smile through any situation. She joyfully, faithfully and selflessly served her family and anybody else who came into her home. Sue is survived by her 4 children and their spouses: Sara and Ben Brigham, Rebecca Riddering, Samantha and Kevin Brandon, and Luke and Christina Riddering. She also had four grandchildren: Seth and Hana Brigham, Karis Brandon, and Mark Riddering. She is also survived by her mother Constance Foss, her older brothers and their wives: Ken (Jan), Andrew (Diane), and Richard Foss (Jan), her mother in law, Delores Riddering and her two in laws and their spouses, Wayne Riddering (Deanna), Lynn Mackereth (Jim), and numerous nieces and nephews. Services to be held at First Christian Church in Santa Maria, Tuesday January 5th, 2009 at 1:30 PM, graveside committal to follow. In lieu of flowers, the family is requesting that donations be made to the Mark Riddering Fund at Rabobank, with the proceeds to benefit charities close to Mark and Sue. I will forever miss my chance to know Susan. I pray for the family and hold the image of Mark and Susan together in heaven. I am thankful for their loving acceptance of my son, Steven, into their family. I am also very thankful for their daughter Becky in our family. I have been missing Mark and Sue greatly these last weeks. It will just not be the same without my weekly visits to their home. They were such a great example of how to live the Christian life in spite of difficulties. Their devotion to each other and to the Lord will forever live in my heart and mind. They are together with the Lord and that gives me great comfort. One day I will join them and then there will be no more goodbyes. I love you Mark and Sue. I send you my deepest sympathy and share your sorrow although I didn’t get to see either Mark or Sue before their deaths. I learned of their passings late. I have had trouble with my computer and have lost a great deal of my emails. Please contact me with your address and if you can locate Richard Koerner’s address which I also lost please foward that to me also. I send you and your family, Wayne and his and your mother my most heartfelt regret at the loss of both Mark and Sue. God will keep you strong through your sorrow and your faith will support you. I only wish I could be there to share in your grief and support you through some very long days and nights. I just received your note yesterday and had to read it several times to actually believe that Sue had died so soon after Mark. I’m having a hard time grasping how this could be. We will always remember the Easter you took us in for dinner and the visits we had together. We also remember fondly the time we were given use of the June Lake Cottage for a few days in 2002, after I had worked at Marion Med Center for 4 months. What a wonderful blessing your parents were to us and many others. We were contemplating coming to SM again this summer for a visit, wish we could have done this earlier.